It has long been established in most free countries that price controls serve no useful purpose, yet here in The Bahamas the political class continues along as if business is a game of Charades. Price controls played a prominent role in communist countries where freedom is limited and their economies completely closed, leading to an abysmal standard of living for their citizens. Examples include Russia and China. Cuba and North Korea on the other hand remain stuck in a time warp where economic policy is concerned. Even though the US government does not control prices Wal-Mart manages to sell their goods at everyday unbelievably low prices. In The Bahamas, the food vendors sell their breakfasts and lunches for $1.00 and $1.50 respectively without the Price Control Act forcing them to sell at prices that some bureaucrat decides is “fair”. The reality that is often missed by politicians and bureaucrats is that it is not in the best interest of a business to over charge for goods and/or services because consumers are smart enough to find alternatives – local or foreign. A business must cover their costs and make a profit to keep the doors open and by extension, fulfil consumer’s needs and desires. However, if one were to accept the premise that most Government’s believe they are “helping” Bahamians with price controls, you would not think that the unintended consequences of this “noble effort” would be food shortages that hurt everyone. Good day Mr. Pritchard, Hope all is well with you? 1 pallet 5 lbs mahatma Gold rice – special price please. Thanks for your order Mr. Wong, but until Price control gets new pricing for us we cannot import the usual number of containers. Since they have taken so long we have lost the supply from the plant in Houston…they have sold our allocation to non priced controlled countries. We realise that your customers will be complaining but the matter is beyond our control…sorry about this. In the example above, the wholesalers have been subject to price increases of up to 30%, as a result of the world market, and our government is not efficient enough to process their required paper work in time so goods can be ordered to stock the local store shelves. It’s a perfect example of government price controls causing food shortages. In another case, a local wholesaler has had to place up to 50 calls to receive the correct price control sheets to price products to get goods to the shelves. A process that should take minutes to resolve took days to complete. After exchanges to help the price control division correct their errors, the wholesaler finally gave up and collected the incorrect sheets. To make matters worse, reports are that the Price Control office has moved and has been without phones for some three weeks so far! This “process” is what frustrates business people and inevitably the Bahamian consumer because they cannot get the goods they require. And in this case it prevents them from getting basic food items. 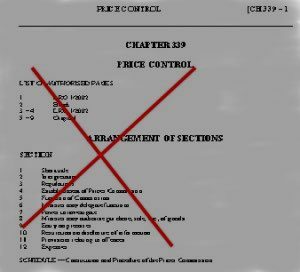 The Bahamas Price Control Act was implemented with much fanfare in the early 1970’s as a political tool to help protect the “small man” from what was, and is, described as the evil business community making a profit at the expense of the “small man”. Instead of the Price Control Act, The Bahamas Government should create the necessary conditions where competition, honesty, old-fashioned hard work, ideas and entrepreneurs are rewarded. Research indicates that Jamaica, certainly not a bastion of free market principles, abandoned price controls and prices fell over time as a result of a more competitive market. The importance of prices as signals on how to behave should not be overlooked. A higher price means that the good or service is relatively scarce and tells the consumer to reduce consumption and look for substitutes. At the same time manufacturers are signalled to produce more. In other words, prices allow allocation of the good or service to those who value it most. Price controls will continue to create further reductions of supply, black market prices or both. Most of the free world has already assigned price controls to the dustbin of history. Any prudent government would tell the Bahamian public the truth about this ill-conceived policy and do the same.